When word started going around at the Victoriaville Musique Actuelle Festival in Quebec in 2005 that saxophonist Anthony Braxton wanted to sit in on noizemakers Wolf Eyes' set, most people dismissed it. 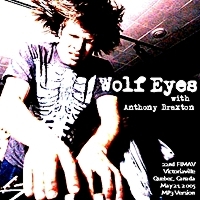 But the meeting did take place and that led to the Wolf Eyes-Anthony Braxton album, Black Vomit, which was voted No. 14 among the top 50 albums of 2006 by Wire magazine. Of the celebrated meeting on the Quebec stage, this is what Bruce Lee Gallanter posted on the internet: "When this young, punky [Scandinavian] noise trio came out and told us that Mr. Braxton would be playing with them - there he was, many were quite shocked. Wolf Eyes is an odd trio of homemade electronics, electric guitar and sax/more electronics. John Olson, their big shaved head saxist, was also their spokesman and was pretty funny and quite astute. They started with all three members playing some scary processed cymbals as Braxton played some quieter sopranino on top. The trio moved through bowing and scraping metal, intense guitar feedback and growling electronic noise-scapes. It reminded me of Organum at times, just not as accomplished. They ended in a frenzy of pounding noise with screaming vocals that was almost too much. For their encore, they asked Mr. Braxton if they should play their hit, Black Vomit, and he said, 'Of course.' It was a tribal, throbbing epic of slow noise that grinded, growled and groaned until it hit its stride and exploded with Braxton squealing sax riding on the waves. Not what anyone would have expected, but it worked and showed how barriers occasionally disappear up at Victo." This audience recording is on the rough side but it's still full-on metal, noize and wailing sax. Note: Due to the size of the file, please be patient when downloading. Click on the link to order Black Vomit .